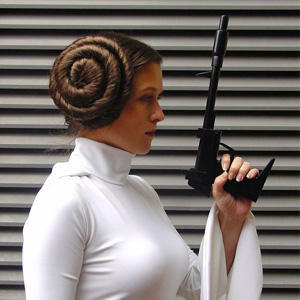 Some of the first Star Wars merchandise ever made was for women to wear, which I think is awesome. In 1977, before the well known action figures hit store shelves, Weingeroff Ent. 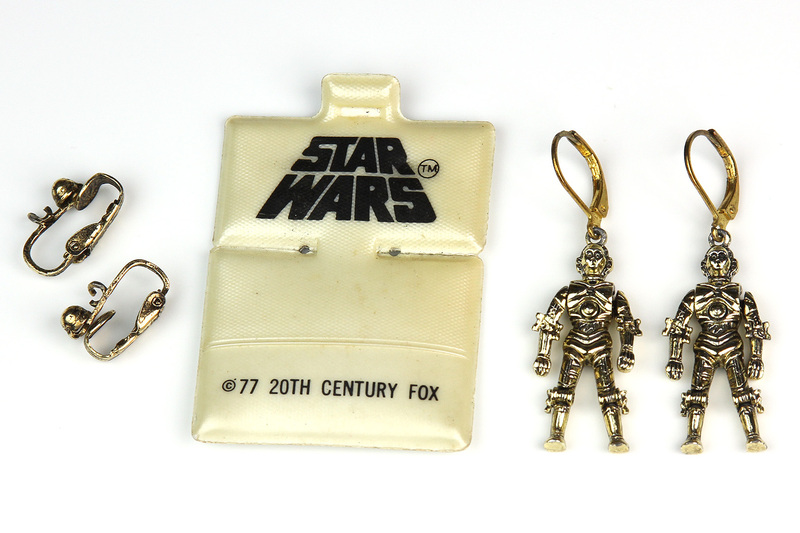 Providence, R.I. (licensed by Factors Etc, Inc) was producing licensed Star Wars jewelry, which included necklaces, earrings, rings, bracelets, hair clips and pins. 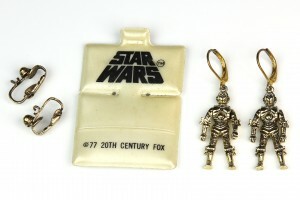 I have been tracking down these items for my own collection and wardrobe – including this pair of C-3PO clip-on earrings. I have my ears pierced, so I don’t wish to wear clip-ons, but the sculpt on the C-3PO is too neat to leave them unworn. There are versions of these earrings already made for pierced ears, but they are much harder to find – these ones were cheap, and only require a minor alteration to wear. The non-destructive modification can of course be reversed if ever required, but I enjoy giving new life to items designed to be worn. Using some fine tip pliers, I was able to carefully bend open the ring of the clip-on earring part, removing them from the C-3PO figures. 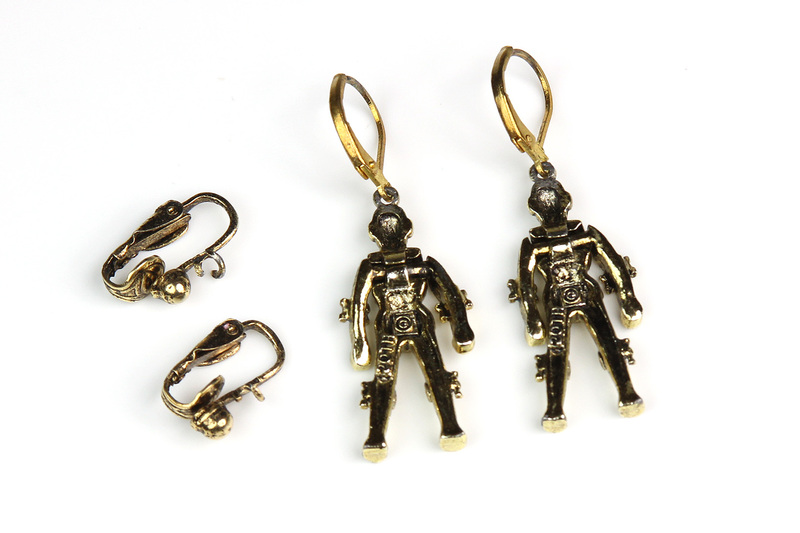 I purchased modern pierced ear jewelry hooks from a local store and opened up the attachment rings to close through the ring on the top of C-3PO. 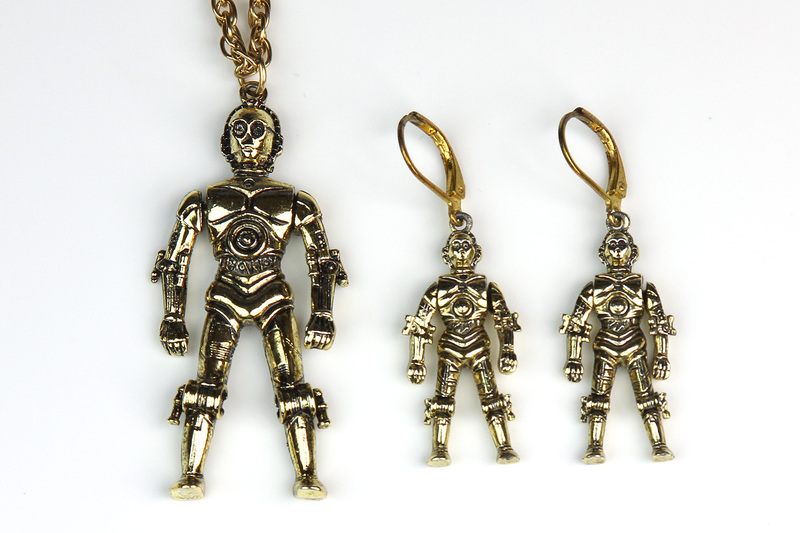 The colours of the hooks and figures are slightly different (the C-3PO’s are more gold in person than they appear in the photo) but it is not very noticeable when worn. 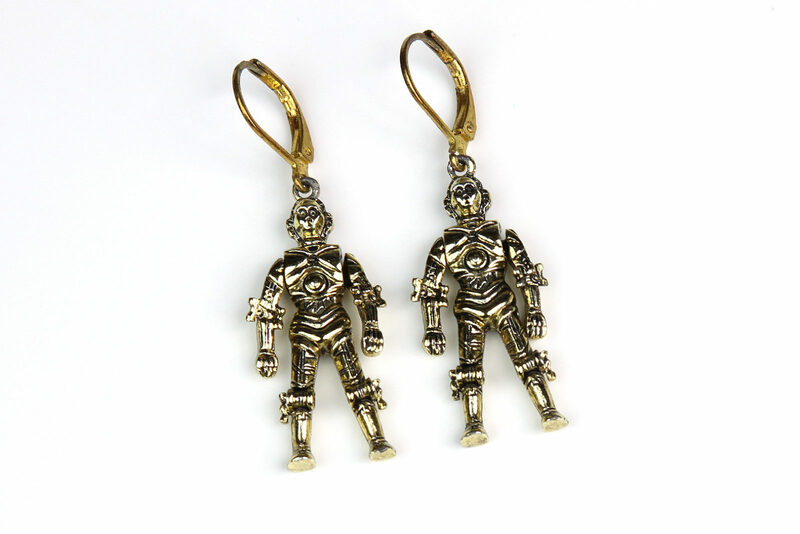 More of a simple modification rather than a full DIY, but I love my C-3PO earrings – the figures stand 3cm tall, are full metal, and his arms move! 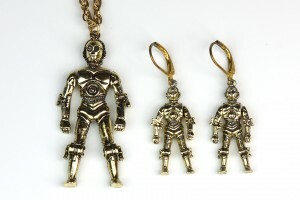 They are smaller than the matching C-3PO necklace from the same collection, as shown in the size comparison photo below.